Once again, Wall Street is overlooking the signs that a 2016 stock market crash is more than imminent. In fact, some signs point to a stock market crash happening this month. There are two events in June that signal the global economy is not healthy. Together, these events could create a panic across the world's markets that causes a global economic collapse. An important indicator of economic health is if the U.S. Federal Reserve can raise interest rates. By increasing interest rates, the Fed shows that it believes American consumers still have enough money to purchase goods despite the fact it costs more to borrow money. But when interest rates are lowered or left low, the Fed doesn't have faith. Low interest rates indicate the Fed thinks consumers don't have enough income to pay higher interest rates for homes, cars, and other goods. And one of the biggest signs the Fed won't raise interest rates in June just popped up this morning – the May jobs report. Although unemployment fell to a nine-year low of 4.7%, job creation in May was spectacularly low. According to the U.S. Labor Department, only 38,000 jobs were created. That's the lowest number since September 2010. Without the new jobs to increase spending, the Fed won't be able to raise interest rates at the next FOMC meeting on June 14-15. Because of the poor jobs data, slowing Chinese economy, and currency devaluation across the globe, the Fed's inaction speaks volumes on how bad the economy really is. That's just one of the biggest triggers for a stock market crash. Brexit, an abbreviation for "British exit," references the possibility of Britain withdrawing from the European Union (EU). Although Britain's currency is the pound instead of the euro, the country is still a part of the EU. Under the EU's agreement, all 28 members have to trade under an established set of rules. You see, Britain is the largest trading partner of the EU. If the Brexit occurs, it's not clear if Britain will still have a free-trade arrangement with the EU. Without a clear arrangement, value-added taxes for British goods would have to be collected at the border of EU importers. This causes less incentive for Britain to trade within the European Union, which could ultimately devastate the economies of its members. Over the last three months, the economic uncertainty has contributed to the London Stock Exchange falling 7.95%. This important referendum will take place on June 23, almost a week after the FOMC meeting. So ahead of these triggers for a 2016 economic collapse, Money Morning had to make sure our readers were prepared. 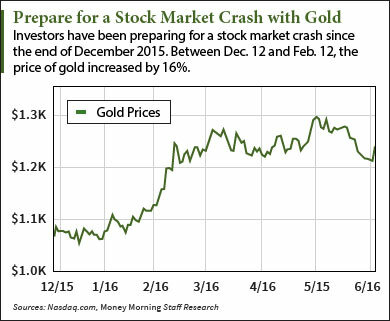 One of Lewitt's top tips to prepare yourself for a stock market crash is to buy gold. Now, it's true the price of gold has squeaked by with a gain of just 2.4% over the last month. But investors shouldn't view gold as a typical investment like a stock or bond. Instead, gold is a "safe-haven" investment meant to insulate your portfolio. It protects you from losses if the U.S. dollar is weak and stocks are faltering. According to the World Gold Council, gold demand reached 1,290 tonnes in Q1 2016. That's a 21% increase year over year. In December, gold was trading for $1,061.67 per ounce. On Feb. 12, gold traded for $1,233.50 per ounce – a 16% increase in just two months. For comparison, the Dow Jones Industrial Average and Nasdaq fell 7.48% and 12.08% over the same period, respectively. Investors interested in adding gold to their portfolios can invest in two ways: buying physical gold and buying gold exchange-traded funds (ETFs). You can find out how to buy gold right here. In the event of a stock market crash, you can still make money by shorting – or betting against – the S&P 500. ProShares Short S&P 500 (NYSE Arca: SH) is an ETF that goes up every time the S&P 500 goes down. SH opened this morning at $19.92 per share, but it traded for as high as $97.08 during the 2008 financial crisis. If the market were to crash and SH traded at that same price, it would be a profit of 386% from today's opening price. SH traded at a 52-week low of $19.85 and a 52-week high of $23.90. That means SH doesn't typically have volatile price swings, which makes your investment fairly safe even if a stock market crash doesn't occur. Fiat currency may eventually lose all of its spending power, but Lewitt calls the U.S. dollar still the "best of a bad bunch." Due to currency devaluation and "incompetent central bankers," Lewitt says investors shouldn't own euros or yen. That's because the Bank of Japan's negative interest rates can't generate positive economic growth. He states that negative interest rates will destroy capital. And holding cash gives you one big advantage during a stock market crash: the resources needed to buy beaten-down stocks. In June 2014, Warren Buffett held a whopping $55 billion at Berkshire Hathaway Inc. (NYSE: BRK. A, BRK. B). Buffett is known for waiting for value, and his massive cash pile is only put to work when he finds the right deal. On May 16, Buffett disclosed Berkshire had a $1.02 billion stake in Apple Inc. (Nasdaq: AAPL). According to CNN, Berkshire acquired AAPL stock for $109 per share. Even though AAPL opened this morning at $97.83 per share, analysts at Thomson First Call have a one-year price target of $123.98 for Apple stock. That's a 13.74% profit from what Buffett paid for Apple. The Bottom Line: In review, investors have three strategies to not only protect their wealth, but make money during a stock market crash: buy gold, bet against the S&P 500, and hold cash. Get Out of These Stocks Now: As part of a preparation plan for a 2016 stock market crash, Lewitt has sent out an urgent warning to investors. He believes these six retail companies could go bankrupt. Click here to see Lewitt’s time-sensitive warning. It's always amazing to me how people can pull literally anything out of thin air to predict a crash. If time has told you anything it's that you can't predict it and can only do so much to take precautions.